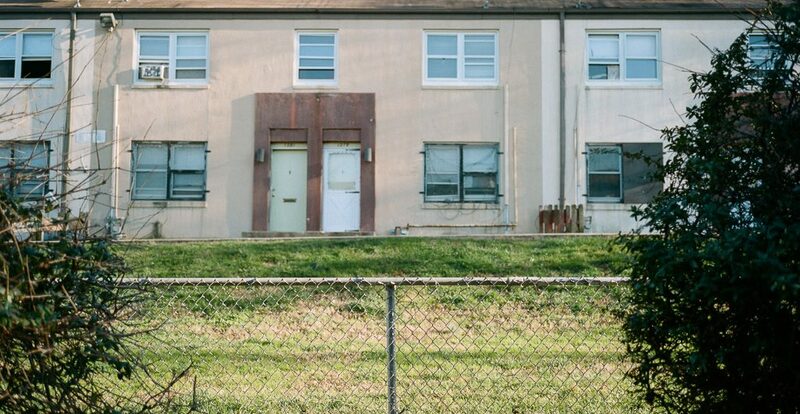 From the bottom of Stevens Road, in Southeast D.C., Barry Farm is a warren of dilapidated, water-damaged and boarded-up dwellings behind chain link fences, separated by common areas and terraced hillsides. At the top of the hill, the road ends at a one-way street. Turn left and a “Do Not Enter” sign marks a street that runs back down through a similarly arranged block. Including a pair of apartment buildings on the property, there are 432 units in all. Most days, young men linger on corners next to low concrete walls, many no longer residents but drawn to where friends and family still live. Unknowns can expect to be greeted with suspicion, or worse. Yet despite the ominous neglect of Barry Farms — locals use the plural form — it is not uncommon to see a child roller-skating down the hill, or waving to a stranger from behind a tattered screen door, or toddling around in a fenced-in yard scattered with rusted barbecue grills and plastic three-wheelers. For $30, right there on the street, you can get your car detailed better than at any car wash in town. The Barry Farms Tenants and Allies Association are gathered this October day at the home of Paulette Matthews to discuss concerns common to many residents of public housing, from water leaks, mold and infestation, to busted mail boxes, drugs and violence. 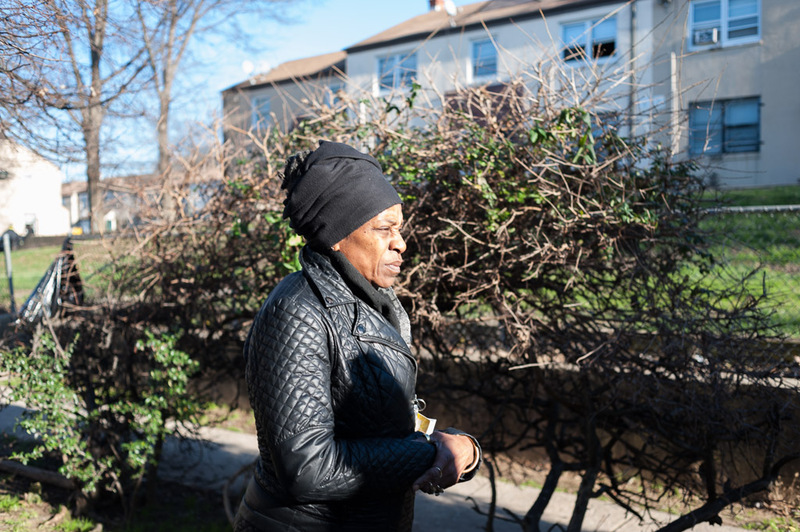 “These places weren’t in the best condition back in the day, but looking at them now, that was the best they ever were,” says Jewel Sims, a resident of 21 years. Life can be rough in Barry Farms. Violence has visited Matthews and both of her sons, one of whom lives with a relative. Break-ins are ordinary occurrences in the neighborhood, because door locks are easy to pick and window bars can be unbolted. “If you used to live here, and your human trait is to do break-ins, you come around to your old neighborhood, you know how to break in,” she says. 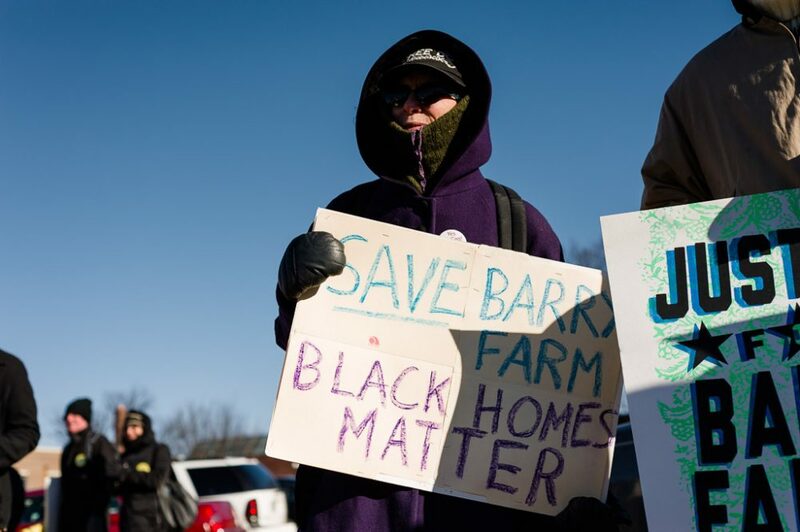 Matthews and her neighbors also have a nagging long-range problem: The city plans to demolish Barry Farms under the D.C. Housing Authority’s controversial New Communities Initiative. Residents fear they will be displaced to make way for a new development consisting of market rate and affordable housing. Currently, rent in public housing is set at 30 percent of the household income and DCHA is promising that eligible residents will be offered newly built, subsidized units on a one-to-one basis. The key word is “eligible.” Lease violations, criminal offenses or unpaid rent can result in eviction or disqualification from returning to a redeveloped property. Such is the lack of faith in the system, that an exodus has already begun. The agency says dozens of families have been accepted at a pair of private rental properties intended for persons at or below 60 percent of Area Median Income. Even more have left Barry Farms for other public or private complexes, or to purchase a home, or due to a fire, according to DCHA. At the end of 2015, only 254 units were occupied. “Once you get out of public housing you never come back,” says Matthews, a resident for 19 years whose home is stocked with fliers and “Occupy Barry Farms” signs that suggest she and her neighbors will not go quietly. “They say they want to unify these communities, but next thing you know, all these places are boarded up,” she says. Barry Farm is located east of the Anacostia River just over the Frederick Douglass Bridge, bounded by I-295 to the north, Suitland Parkway to the east and St. Elizabeth’s Hospital to the south and west. The closest subway stop is Anacostia Metro Station. The neighborhood is named for James Barry, a 19-century farmer who in 1867 sold hundreds of acres to the Freedmen’s Bureau, which sold lots to freed slaves and Civil War refugees for $300 per acre, making it the first community in the District for African-American homeowners. Nearby streets — Howard, Douglass, Stanton, Sheridan — are named for abolitionists of the time. In the early 20th century, B & O Railroad construction separated the community from the river, and by mid-century, military bases and highway construction further isolated it from the waterfront. In 1954, the Redevelopment Land Authority eliminated what had become substandard housing and built the dwellings that comprise Barry Farms today. Decades of regressive housing policies and zoning laws turned the complex into an isolated enclave of poverty, drugs and violence, a notorious neighborhood that follows its inhabitants when they venture outside its boundaries. “Just because someone from the The Farms done something, you don’t have to be involved, they’ll get you or get someone else from the Farms,” Matthews says. 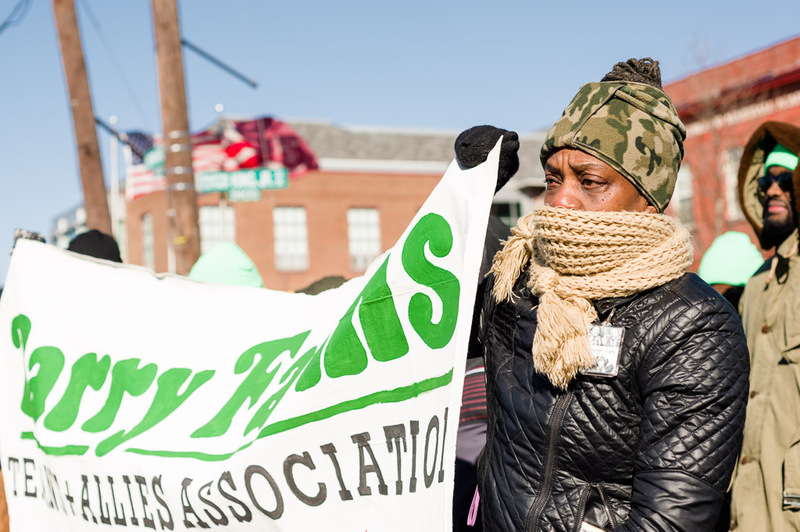 In 2011, the Metropolitan Police Department designated Barry Farms as a HOT SPOT, with a 24 hour-a-day, seven-days-a-week police patrol, according to an internal memo addressed to then-Mayor Vincent Gray. Over the next several years homicides decreased, but more common crimes, such as gun possession, assault with a dangerous weapon and theft, persisted, according to MPD’s crime index report. From 2015 to 2016, crime in Police Service Area 703, which includes Barry Farms and nearby Hillsdale, increased in all but three categories. Matthews, at age 56, is just as vulnerable financially. 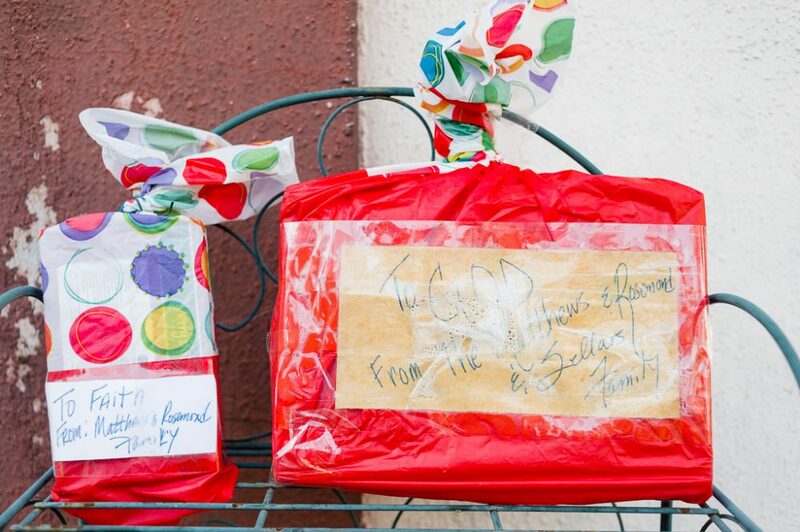 With no job and an adult son under her roof, she gets by on food stamps, support from Wider Circle, a group that serves people seeking a way out of poverty, and occasional help from her family. She owes DCHA thousands of dollars in back rent and has been turned away by various charities that do not provide such assistance. 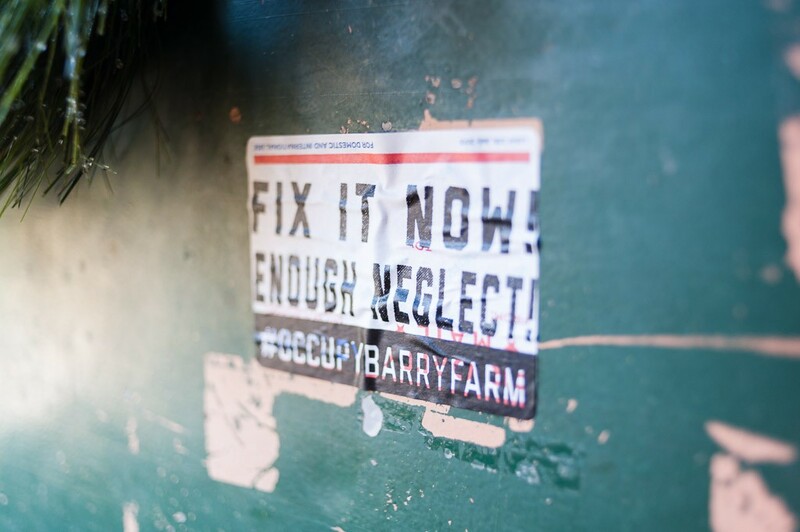 DCHA often fields complaints from residents and public housing organizers about conditions at Barry Farms. The agency has just a 16-member maintenance staff. “Like many housing agencies we’d prefer to have more staff on site but limited federal resources do not allow it,” says spokesman Christine Goodman in an email to The District Dig. Trust is hard to come by. DCHA has elected officers who serve three-year terms on a “Residents Council,” designed as a tenant voice and DCHA’s “ears, eyes, and mouthpieces,” according to its chairman of the board. Testifying before the housing committee last year, two officers back a city budget proposal to allocate less than $1 million — roughly $171 per-unit — for minor repairs in public housing, citywide. Yet DCHA also recognizes that plumbing and electrical systems are out of date, with most units on their way to being uninhabitable. “It is fiscally irresponsible to use capital funds on major renovations at a property slated for redevelopment when those funds could be used at another property,” Goodman says. 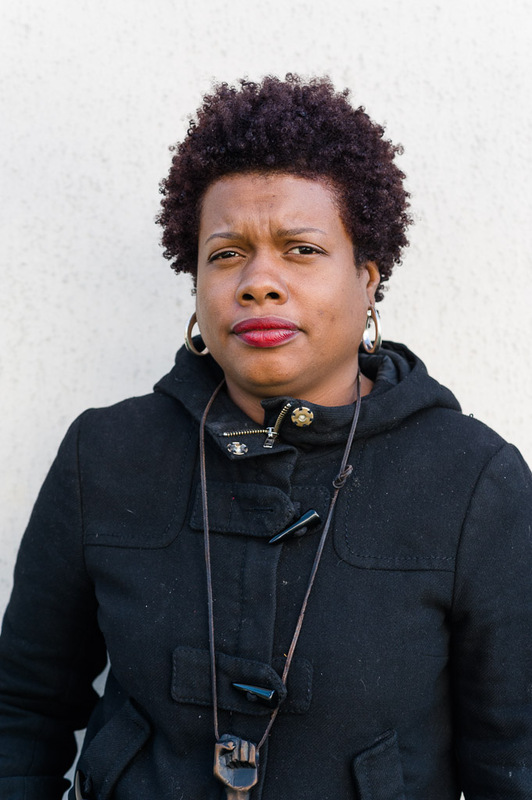 Schyla Pondexter-Moore, an organizer for Empower DC’s Public Housing Campaign, says her group asked the city council for $50 million for priority infrastructure repairs throughout the city. She was dismayed to learn that, instead, less than $1 million would go to power-washing, light bulbs and window shades. “We need to address water damage, not window washing,” she says. Just last month, however, the United Nations Working Group of Experts on People of African Descent recommended that U.S. cities halt demolition of public housing without first guaranteeing replacement units and “prior and informed consent” of the affected communities. The group’s report, published by The Office of the United Nations High Commissioner for Human Rights, takes aim at the displacement of African Americans from city centers to make way for new investment and development. 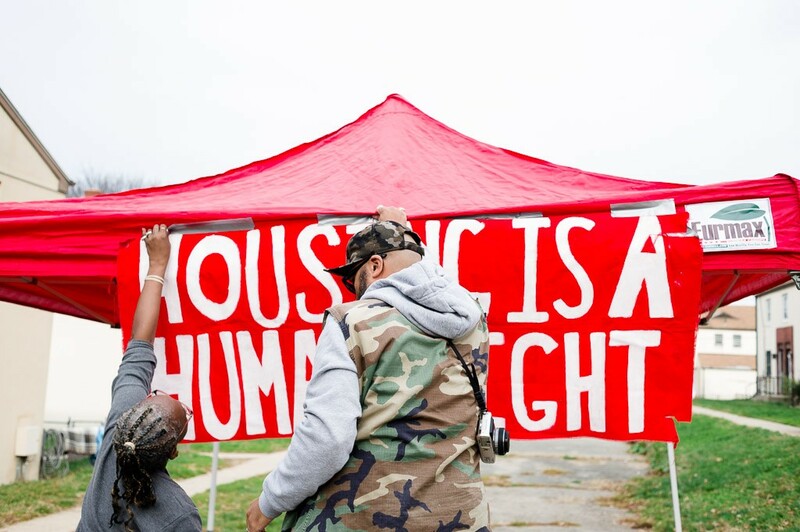 “In particular, the Working Group was alarmed by incidents of eviction, demolition and conversion of Barry Farm public housing in Washington D.C.,” the report states. Matthews and her fellow tenants are fighting for meaningful repairs, and to remain in their units while new ones are built. But again, DCHA sees the costs of “redeveloping in place” as prohibitive. 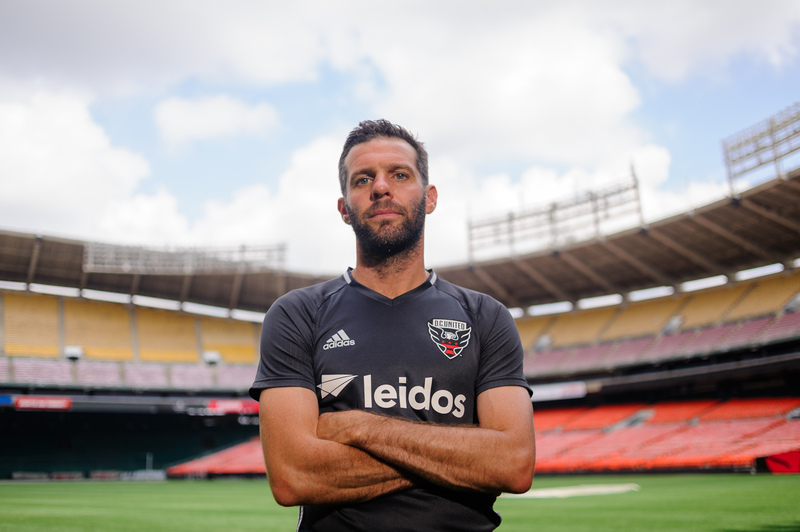 “Due to the scale of the redevelopment, including demolition and rebuilding of not only the buildings, but also the infrastructure, redeveloping in place is not feasible,” Goodman says. For families in poverty, one misfortune leads to another. And sometimes, DCHA, the city’s largest landlord, makes matters worse. Matthews had been steadily employed for more than a decade at the National Zoo, working her way up from food services worker to groundskeeper supervisor, when she got injured and was fired from her job, around 2010. She was re-hired, but lost her supervisor position, and re-injured her back one day in 2011, when a truck seat flipped and sent her crashing into the door panel. Unable to work, and ineligible for disability or Social Security, she collected family medical leave for a time, but was unable to get her job back. She’s been unemployed ever since. 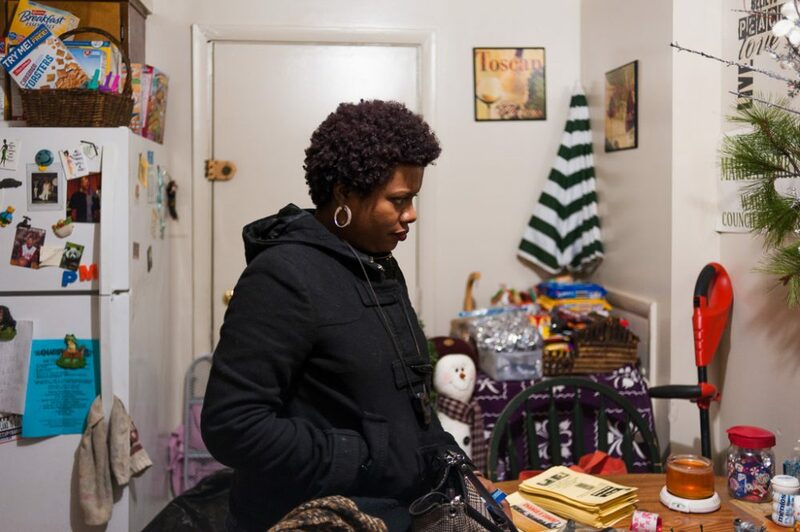 As unpaid rent piled up, DCHA froze her obligation and put Matthews on a payment plan of $50 per month, which she was able to afford with Temporary Assistance for Needy Families and child support. Once child support dried up and her temporary assistance expired, she fell deeper into the hole. 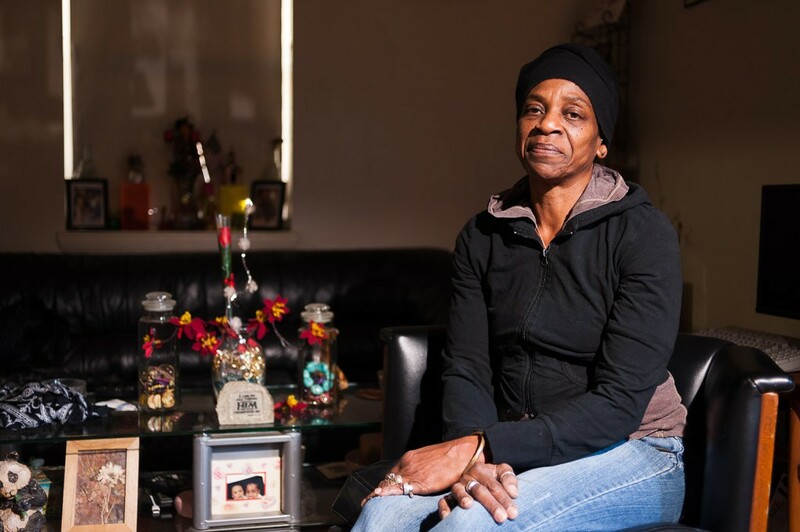 She sought housing assistance, but because DCHA continued to issue 30-day lease termination notices without resolving her case, she has remained in limbo, her debt mounting. She finally goes to an eviction hearing later this month, and is worried that the agency let her sink too far for her to expect a fair hearing. On November 16, Matthews and her younger son, who is 20, are in court for a preliminary hearing. Through their lawyers, they deny any wrongdoing. The judge nevertheless sends their cases to a grand jury, then allows the two to walk out of court without setting a court date. Less than a week before Thanksgiving, Matthews comes home to find another 30-day lease termination notice, this one related to her criminal charge. Her consequences are dire: No job, out of money, facing eviction, waiting for court date. It begins to dawn on her that this is how people end up in a homeless shelter or on the street. Matthews mans one of the tables as volunteers and fellow organizers fan out, knock on doors, gather signatures and advise tenants on how to protect their rights. They are not just fighting for Barry Farms, but public housing in general, says Pondexter-Moore. The turnout is light. Rick, who is certified in HVAC repair, but who cannot get hired for lack of work experience, is upset about the scarcity of job training and other outreach services. He and Milton are irked that a multimillion dollar recreation center a few blocks away, complete with an indoor pool and computer lab, is essentially off limits to Barry Farms residents who do not have an ID. 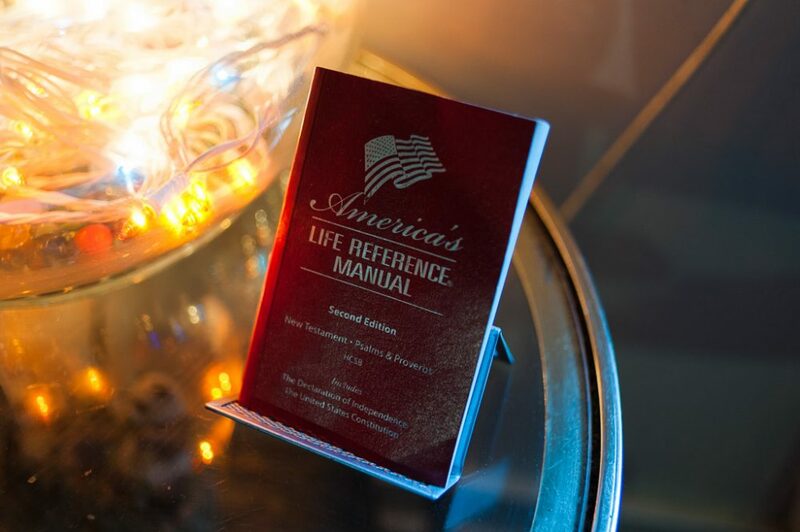 They explain that getting an ID is not as easy as it sounds; it requires certain documents that many do not have access to, such as a birth certificate, Social Security card or utility bill that shows proof of residence. Contrast the overall decrepitude of Barry Farms with the rec center, they say, and it seems like two completely separate worlds, side by side. “They could’ve taken the money for the rec and used it to help us but they’re going to make it look good for when they get rid of us,” Rick says. “It ain’t for us,” says Milton. An hour later, MPD and Homeland Security patrol cars are still crawling up and down Stevens Road and in the alleys that line the edge of The Farms. Seated in his marked SUV, a lieutenant with the Housing Authority says that prior approval from the rental office is required for groups to broadcast through a speaker on a public site. The situation has de-escalated, but the damage is done: Every negative perception, every feeling of disenfranchisement, and resentment, have been reinforced in one moment. The organizing done for the day, the volunteers break down the tent. “This is ground zero,” Pondexter-Moore says, as daylight begins to fade. “I’ve never seen anything like it,” says a woman named Miss Beverly, a volunteer who coordinates artwork for the advocacy effort. Meanwhile, residents who seem to be uninvolved with the tenants association begin congregating on sidewalks. From down the hill, an electric blue sedan, freshly detailed, comes tearing up Stevens Road, Go-Go music blaring. It’s early January, and Matthews says she was nearly moved to tears by the generosity of charity groups that donated Christmas gifts to her and her son. Her situation is unchanged, however, and the stress is testing her. “You think things are half-right and then you find out they’re not,” she says, after missing a hearing at DCHA because she’s out of bus tokens. But she’s receiving assistance at MBI Health Services, a company that offers health and mental health services, and recently received a certificate from the Far Southeast Family Strengthening Collaborative so she can apply for a food services manager position. She insists her spirit will not be broken. Despite all the frustration, Matthews’ cluttered living room contains signs of resiliency, and hopefulness. There’s folk art on the walls, and framed inspirational sayings such as “Don’t Quit,” and “Never Run Faster Than Your Angel Can Fly.” A small painting of Chuck Brown on painted wood sits on a shelf just above a drawing of Nelson Mandela. Out front, as the ladies get ready to roll out into the neighborhood, Matthews’ yard also seems to embody conflicting emotions and chaos. The sun is out, and Halloween decorations are still strewn about, including handmade dolls with heads made of stuffed pillow cases. Holes on the door frame expose metal lath, crumbling plaster and peeling paint. A blow-up Santa Claus and Christmas lights adorn one side of the front door; a rusted, disconnected gas meter the other.